The Church at Southpoint grieves with our partner, Emanuel Baptist Church in El Salvador over the tragic loss of Moises Funes, Mayor of Alegria. Last summer, Moises worked alongside our Broadmoor Baptist mission team to build houses for people in his district. 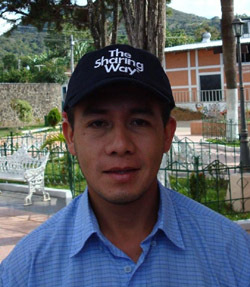 Moises was assassinated while travelling to a building site in his car on January 9th. The Mayor had recently been elected on a platform of non-violence and anti-corruption. He leaves behind a wife and two young sons. Moises was only 31 years old. He was a great friend of Canadian Baptist Ministries and The Sharing Way and was deeply grateful for the work undertaken by Canadian Baptists to improve the quality of life of the poor in his community. Southpoint is planning to send a team down to Alegria next summer to continue in the work of providing housing for poorer families.